The fund-raising project at the Pin Junction, e@The Curve was held on Sunday, 24 January 2010. We managed to secure 20 teams of 3 bowlers per team playing 3 games each. It was attended by 10 Lions – OC Poh Ling, Jamie Chen, Josephine Yeng, Lynda Yeng, Yvonne Cheong, Katherine Yong, Irene Hoi, Nancy Soh, Chwee Chin and Jennifer Chong. The proceeds will be channeled to the Students Welfare and Club Project Fund. The funds to the Students Welfare Fund will be used to sponsor meals for the students for a period of one year as well as to purchase uniforms to selected students identified by the schools headmasters/mistresses. 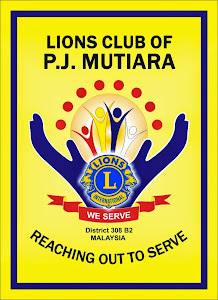 In addition to the RM4,000.00 raised from the registration fee of the 20 teams at RM200 per team, the members also managed to secure a whopping cash donation of RM5,100.00. The total amount raised was RM8,000.00. At point of writing, the total expenses have not been finalized except for the bowling charges of RM1,110.00 and a provision of RM100.00 for miscellaneous expenses. The registration started at 8.30am and was completed by 9.30am. However we could not roll off the games as there were some technical glitches and miscommunication which resulted in the shifting of lanes by the bowlers, twice! Finally at 9.45am the MC Lion Nancy started her welcoming speech followed by the address by our 1stVP Lion Lynda who represented the President as he could make attend due to work. Thereafter the Guest of Honor, R5C Lion Jean Teoh was called to give a short speech followed by the opening of the project by rolling a ball at Lane 10. The bowlers had more than 5mins of practice before the games finally started at 10.10am. From there on it was smooth flowing until the last game ended at 12.30pm. As R5C had to leave early for another project, the OC was given the honor to present the prizes to the winners witnessed by 1st VP Lion Lynda. The team champion went to MD Engineering with a total of 1,531 pinfalls. The 1st runner up to 3A with 1,432 pinfalls while Builders were the 2nd runner up with 1,366 pinfalls. Male and Female Hi-Series Champions were Albert Yeoh (3A team) and Shina Yong (SCS Friendly team) with 581 pinfalls and 463 pinfalls, respectively. The team champion received a certificate each, 1 hamper per team and 3 bathroom cabinets. The 1st runner up had a certificate each, 1 hamper and 3 dish drainers whilst the 2nd runner up were also given a certificate each, 1 hamper and 3 cup stands. The hi-series male and female each received a certificate and a hamper. 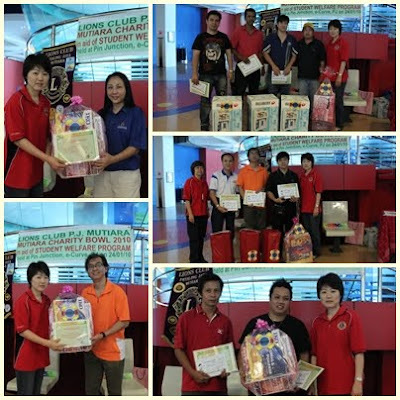 The team winners also received a slimming voucher worth RM1,000.00 each. As the OC, I am very fortunate to have worked with a group of very supportive members. The team work was tremendously remarkable. My sincere and heartfelt thanks and appreciation go to all of you.